A golfing paradox: if you hit down on the ball it goes up, and if you hit up on the ball it goes down (or at least doesn’t get up very high). In general, that’s correct, but as playing advice, it’s not quite right. Of course, we want to get the ball in the air. The higher the better, it seems. I read where Gary Player, during his playing days, was commenting on Jack Nicklaus hitting a 3-wood. He said while some players hit that club farther than Nicklaus did, and some players hit it higher, no one hit it that high and that far at the same time. And I saw it, too. At the 1973 Andy Williams Open in San Diego, Nicklaus on the 72nd tee hit the longest drive I’ve ever seen, and the highest, and it was the same shot. I’m still amazed. My son wants to get the ball in the air. We go to the range together and I see him, time after time, lifting as he comes through impact. Now, he does hit a high ball when he connects. Too many times, though, he doesn’t, because of the tiny room for error. The ball doesn’t get up when he misses. I catch myself doing that on the course. I want the ball to go up and the logical way is to swing up. But that doesn’t work. Here’s what does. You know that advice about swinging down at the ball? Please pretend you never heard that. Instead, swing level, THROUGH the ball. Down, at: no. Level, through: yes. Your downswing describes an arc which curves sharply downward at the start, but which is fairly flat at the bottom through the ball. To be strictly correct, since you want your divot to be IN FRONT of the ball, the clubhead still has to be descending when it gets there. That descent is so slight, though, you don’t need to think about it. Here’s what to think about instead. Whenever I remember to do this, the shots I hit are poetry. Make sure your hands get to the ball before the clubhead does (it will be the opposite if you’re lifting) and feel like you’re dragging the clubhead through the ball. Dragging on a level path, parallel to the ground. That’s my image, you can come up with one for yourself if you want to. Just deliver the clubhead to the ball in a brushing-through motion (there’s another image) with the hands leading the clubhead so you can use the loft built into the club to get the ball in the air. This movement seems counter-intuitive. It it feels like you’re de-lofting the club excessively and driving the ball into the ground. You aren’t. You’re just using the club’s design to get the ball in the air for you. You might have to slow your swing down a bit to get enough control to strike the ball this way. Don’t worry. The ball flies off the clubface, high and straight. When you remember to do it. When I watch players who don’t break 100 (notice I didn’t say “can’t”), I see two reasons. One is that they hardly ever hit the ball straight. Two is that they don’t have a good idea of how to play the ball around the green. I see two reasons why players struggle to break 90. One is that they don’t hit the ball straight often enough, and two is that they don’t have a good idea of how to play the ball around the green. Let’s solve the hit straight thing first. 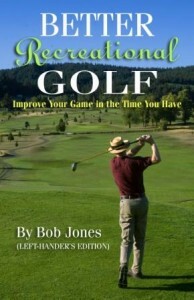 I have lots of posts on this subject, under the label, golf swing. Look them up. They get specific. I’m going to stay general today. The number one reason why you don’t hit the ball straight, if this is a problem for you, guys, is that you try to hit it too hard. That’s not the only reason, but it is the main one, especially if you’re under 40. Do two things for me. First, slow down your swing. Slower than that. You don’t have to belt the ball for it to go straight (and far). Centered, on-line contact is the key, and you get that by slowing down to control the clubhead. Women, many of you need to do the opposite. You need to hit the ball harder. You don’t swing hard enough, and you lack control of the clubhead because of that. You can swing too slowly. Step it up a bit. Make an athletic swing. Now the green thing. All I can say is this takes practice. I go to the range and see the tees lined with golfers and there’s just me on the practice green. I’m not kidding. Maybe someone will come along, throw down a few balls, hit some putts for five minutes, leave, and think they practiced. As for chipping, I see all sorts of chipping strokes around the practice green, and none of them work. People spend their time trying to make an impossible stroke start working. I want so much to go up to them and say, “This is the easiest shot in the game if you know how to do it, but what you’re doing now isn’t it. Go into the clubhouse, sign up for a lesson and have the pro show you. You won’t regret it.” I won’t say that to them, but I’ll say it to you. A putting lesson might be a good idea, too, come to think of it. And then practice, like I said. I spend about 90 minutes when I go to the range, and an hour of that I spend around the green. Why? I’ll never have a great swing. Takes too much time to develop. But I have a good enough swing, coupled with a dynamite green game (chipping and putting) that lets me shoot some very respectable scores. No reason you can’t either. 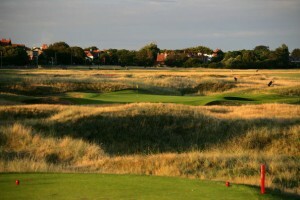 The British Amateur has been played there eighteen times, most recently in 2000. Royal Liverpool hosted a British Women’s Open for the first time in 2012, won by Jiyai Shin. The course appears flat and featureless at first glance, but subtlety is its middle name. It will seem like the wind is always coming from the wrong direction. Gentle mounds, called cops, line the fairways of several holes. They are meant to keep rolling balls from going out of bounds, but will not aid a poorly hit shot. In the traditional course routing, hole 1 is the dogleg right that lines the driving range, which is lined by one of the cops. Going over the cops into the range is out of bounds. Golfers trying to cut the corner had better win the bet. The cop runs all the way past the green and is hard to the right of it, so hitting two balls OB on one hole is not unimaginable. This hole will be played as number 3 for the Open, so the concluding hole can be the 551-yard 16th. The traditional 17th and 18th, being played this week as 1 and 2, are too tame to be concluding holes for an event of this caliber. Every hole deserves its due in this blog, but of special note is the par-3 ninth (new routing), lined by a cops on the backside. Over the cops, OB. The course winds out to the sea from 10-14, heading back inland on the short 15th (pictured). Then the test begins. Three long finishing holes, with par of 5, 4, 5, do the sorting out. Number 16 is easily reachable in two, but pot bunkers on the left front and tall grass ringing the rest of the green require a supremely accurate second to get on in two, with the wind likely to be against you. Number 17 grazes the practice ground again (OB, remember?). Number 18 runs along the practice ground, turning right just beyond the landing area. A direct line to the pin flirts with OB. This hole could induce a contending golfer to attempt a dramatic all-or-nothing gamble in a last-chance effort to make up strokes. Roberto De Vicenzo did just that in 1967 to beat Jack Nicklaus for the title. 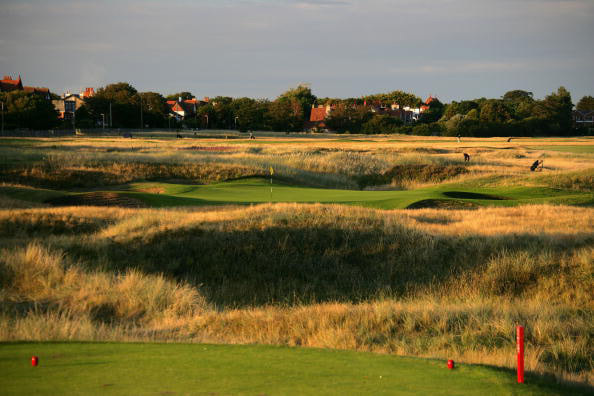 While the USGA loves drivable par 4s, there will be none at Hoylake. Also, the course is well-watered and lush. The strategy of teeing off with a 2-iron, which Tiger Woods used to such advantage in 2006 on a dried-out course, won’t work this year. The players? Forget about Tiger. His decision to enter is questionable, both for his recovery from spine surgery, and for his re-entry into competitive golf. There is no question of him winning or even contending. Most eyes are on Martin Kaymer, and that’s not just front-running. He has returned to the fade that worked so well for him, and his two victories in high-profile tournaments this year demonstrate his mental toughness. But winning another big one is asking a lot from him. Consider the other golfers who have been playing well this year and are lurking around the victory stand. Rickie Fowler has a first-class record in majors this year, finishing 5th at the Masters and 2nd at the U.S. Open. Keep an eye on Adam Scott, Henrik Stenson, Jimmy Walker, Jordan Spieth, and Justin Rose. Angel Cabrera just won a Tour event, and he knows how to win major titles, too. For me, the U.S. Open and the Open Championship rank 1 and 1A. I never can decide which one is which, though. If these were the only two tournaments I was allowed to watch on television all year, I would be content. So many fundamentals, and I‘ve written about them all, many times. The ones I hear touring pros paying the most attention to are aim and tempo. I wrote about aim a few weeks ago. Today, let’s talk about tempo. 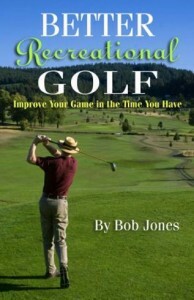 Several years ago, I watched a rebroadcast of a PGA Championship Champions Clinic on TV. At these clinics, past tournament champions teach shotmaking and playing strategies to an assembled audience. Every pro who talked about the full swing on this show said that what he was working on at the time was tempo. Good tempo allows your swing to work like it should, like a tuned machine. Everything works at the right order and at the right moment. 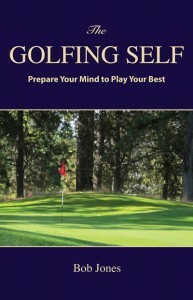 The proper tempo allows you to play golf with a calm mind. In a world filled with technical instruction, it needs to be mentioned that a calm mind is what permits technical excellence to emerge. A lot of what you read in instruction books about finding your tempo is pretty vague, saying your tempo should fit your personality. Easy-going, slow tempo. Fast-paced, quicker tempo. I have no idea where that connection ever came from, or what its basis is, or why champion golfers keep repeating it. It’s not how they did it. Let’s take another tack. I will guess there are moments in your swing when your mind blanks out. Am I right? Somewhere between the start of the downswing and the follow-through there is a piece that happened too fast for your mind to experience. You were following your swing in your mind, and at some point it just disappeared. That represents your tempo getting out of whack. To find the tempo that is right for you, slow down your swing until this blank spot disappears. Swing at a speed such that your mind can follow everything you’re doing, from start to finish. This is not so your mind can give orders, or critique your swing as it goes along. It’s so your mind can observe the whole thing. Nothing more. Once you find that swing speed, that’s the tempo that is right for you. This speed might feel a lot slower than you’re swinging now. Don’t be concerned. The club will still be moving fast enough, and you’ll gain control of the clubhead. That leads to centered hits on a square clubface, which leads to straight shots and good distance.